Zero Energy Four is a four bedroom version of the Zero Energy home series. This revolutionary design features zero net energy use, extremely low ‘near zero’ embodied energy and extremely low cost of around $10/square foot (cost of shell, excluding energy systems). This design is the result of years of research in energy efficiency and low cost, alternative building methods. 1,693 sq. ft. interior plus 901 sq. ft. interior greenhouse, 4 bedroom, 2 bath; footprint: 40′ x 109′ not including cisterns or optional garage. A zero-energy building, also known as a net zero, zero net energy or net zero energy building, is a building with zero energy consumption. Research shows that between 30 and 40 percent of all the primary energy used worldwide is by buildings. The building industry therefore is undisputedly one of the greatest contributors to air pollution and global warming. Over the last decade, people have taken a keener interest in how energy consumption by buildings affects our planet. Many governments today have developed building codes and standards in a bid to reduce the impact that construction projects have on the environment. Sounds like 2,594 sq. ft. interior with 4,360 footprint? It sounds like neither of these include the optional garage or cisterns, so I don’t understand the almost 1,800 sq. ft. discrepancy. Is that all wall thickness, or counting all the space north of the farthest buttress reach, or what…? Garage and greenhouse are not considered living space. Wall thickness has been deducted. I recently purchased this house plan and plan on building it soon. I plan on building as a bermed house with only the front sides and the front exposed. The property has a gentle slope. I want to know is it ok to build this with compressed earth blocks (CEBs) instead of earthbags? Yes, you can use CEBs. But you’ll want an engineer to calculate the back wall that will retain the earth. The pressure against this wall will be very high. The pressure varies according to soil type, depth, etc. so you’ll need a soils engineer to do a test calculations. CEBs are not nearly as strong as earthbags for this purpose. Normally I recommend 24″ wide bags for the back wall. Another big factor is codes. Building codes will almost certainly require reinforced concrete. If you have few or no codes, consider doing 24″ earthbags on the back wall with one of the tube filling machines we’ve recently shown on our blog. This will speed construction 3 fold or so. Then you can use CEBs on the rest. The CEBs look real nice by the way. Just realize they are not ideal in cold climates unless you insulate the outside. Thanks. I recently located to Ghana, so finding the proper engineer may prove to be a challenge. I’ll just plan on earthbags at the back wall and CEB’s everywhere else. I don’t have access to any machinery that would help automate the earthbag proces, but the labor rate is not bad. I like the speed and the look for the CEBs as well. 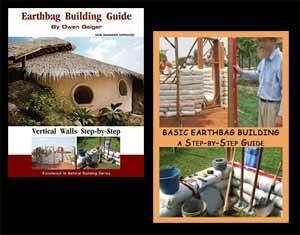 The earthbag filling machines could be hand made by a villager for $50-$100. That cost is negligible when you take into account how many hours you’ll save. Our blog now has thousands of blog posts and it’s getting harder and harder to locate content unless you happen to know the exact keywords. I really like this design as the start of a communal living facility. I imagine it could be expanded out with additional bedrooms without too much trouble. I love the idea of a greenhouse corridor, and I would think that one might be able to do a small-scale aquaponics operation in it. The water tanks would act as good thermal mass, as long as good humidity controls could be put into place. Kevin, I have been trying to find good communal designs for Colorado as well. We are wanting to do do a setup for about 4 people to start but the ability to expand and add on more. What did you end up doing? Thank you very much for the prompt and informative reply! Thank you very much for your reply! I just have one more question. Are there some other designs on your website (besides the Zero Energy series) that – with all the right systems – would be particularly suitable for off-grid living in the colder climate of Northeast US? Any of my designs could be enhanced with extra off-grid systems. Realize that my plans do not show all the details of these options. Hire local experts as needed for each system. As for other plans, the main thing to look for is size, number of bedrooms, appropriate layout for your needs and adequate passive solar. All plans are shown on my Earthbag House Plans site: http://earthbagplans.wordpress.com/ They’re available through Dream Green Homes.com. Thank you for being so inspirational with all the work you do, so open and ready to help everyone with their planning and construction! This really makes a huge difference in so many people’s lives, I am sure! Can the Zero Energy 4 home function completely off-grid like the Earthships (provided that you build it with solar panels, cooling tubes, and the simpler greywater, raincatchment systems that you suggest)? Do you know of any Zero Energy 4 homes built in the Northeast US? My husband and I would really like to see one that was already built and perhaps also talk to the owner-builders about the process. Thanks. The Zero Energy homes would function much the same as earthships, which means they can be built completely off-grid if you add the necessary systems. Most people do not give out their addresses or other personal information and don’t publish their projects. Plus we don’t share client contact information. We do publish every good project we come across on the Internet so people have a general idea of what’s possible. Do you know of anyone that has had success with earhbag building in the cold state of Minnesota. I am interested in ZE4 design with my own modifications but not sure how well the codes here are willing to adapt. Also with the snow I would like to do underground as much as possible. I’m a security nut. Structure1.com can get your home code approved for a reasonable fee. Would this plan be practical for hot climates, such as texas? I wouldn’t choose this plan for a hot climate. Yes, if you include a properly sized roof overhang to prevent overheating. My preference though would be a house with more ventilation and wrap around porches. Search our blog for Passive Cooling Strategies for dozens of simple ideas on preventing overheating. You are amazing! Thank you so much for all the incredible information you put out there. You are inspirational. Thanks. Plans can be converted to metric at no charge. You can use any foundation you want. I show and recommend earthbag (gravel bag) foundations, but you could change this if you want. First of all, well done on giving so much back in life Owen! 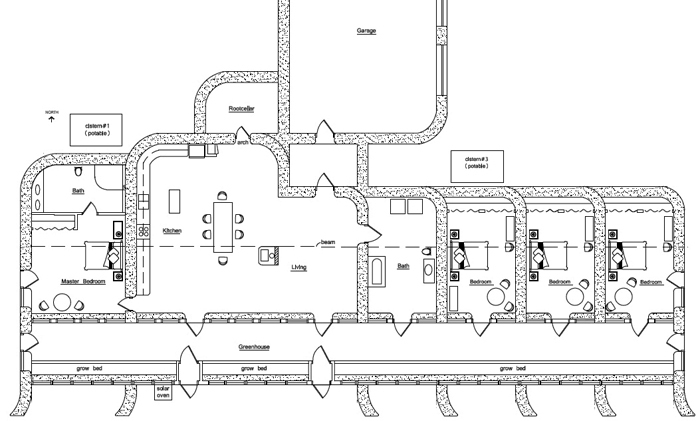 For the zero energy series, you mention greywater recycling systems, I am assuming they will be similar to those of the Earthships, are you able to add that to your plans when ordered? I know the plans do not come with plumbing details, but I have my doubts as to whether a recycling system would be designed locally by my engineers. I propose using a far simpler system. See Art Ludwig’s booklet: Create an Oasis with Greywater. Everything you need to know is in one easy to read booklet. That’s why I don’t bother supplying system details like this. Hint: he shows how to circumvent codes. Thanks for the recommendation Owen! I will order the book right away. I loved his book “water storage” and will do my learning by your recommendation! Have you got any idea how many actually has been built? Maybe in the UK? Are the any photos available? Most people don’t publicize their homes. And most people who write don’t say where they live. But my guess is there are not many earthbag houses in the UK. Maybe just a handful. This is just a guess based on working in this field for a while. There are 2-3 published projects if you search our sites. One is a playground in London. I think there’s a custom home that used some earthbags as well as straw bales. There’s an earthbag architect in London — Paulina of Earth, Hands and Houses. any rough idea how much would cost me this project? I would be grateful for any estimate. The cost depends on many variables that often vary from site to site. You can use recycled bags from farmers or buy new, etc. etc. You have to make a cost estimate based on how you’re going to build (DIY, hire out parts?) using local prices. In short, it can cost almost anything you want from practically free using primarily recycled materials to spending as much as conventional building materials with everything contracted out and new materials.